This formal living room in Eden Prairie is the first room that potential buyers would see from the entry. But the furnishings stood out more than the space. "The space felt negative because of the colorful sofa against the dark background," said Lori Matzke of Centerstagehome.com. "We needed the buyer to feel more welcome and less intimidated by the strong colors." To downplay the forest green carpet and green walls and to give buyers a feel for the actual space, here's what Matzke did. • Traded the colorful sofa and chair for a sage green sofa and chair from the family room. 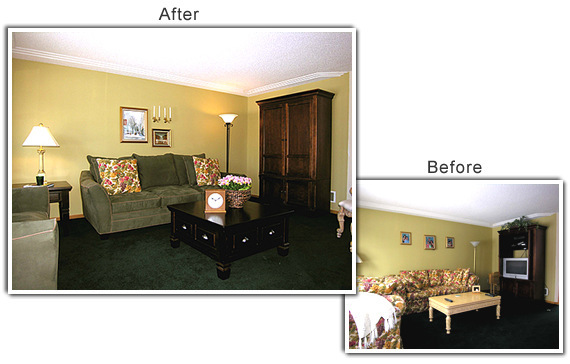 The family room had cream-colored walls and was bright enough to handle the busy upholstery. The sage sofa and chair helped tone down the intense wall color in the living room, while creating less of a contrast between the upholstery and forest green carpet. • Replacing the coffee table with a darker one from the family room adds bulk to the space, helps balance the heavy entertainment center and blend with the carpet. • Matze swapped a heavy metal floor lamp with a narrow brass floor lamp to keep the space feeling proportionate and throw off more light. Leaving all the lights on helps brighten the heavy colors. • A few small, discreet family photos are fine, but large photo displays are a big no-no. You want potential buyers to visualize living in the home, you don't want them to feel like visitors. Instead, artwork and brass sconces draw the buyer's attention into the space without being too personal. • A captain's chair from the dining room set and a small table on the opposite wall (not shown) create a sense of balance without taking up too much space. • Greenery on the coffee table adds a nice shot of color that makes the room feel inviting. Pillows from the brightly upholstered original sofa also add color without overwhelming, and help create a sense of continuity between the formal living room and family space.